New Wave Domesticity: roasted tomatillo salsa verde! tomatillos are the cutest things ever. they are little tiny green tomatoes wrapped in leaves. i found mine at a winco supermarket, but if you have trouble finding them in the supermarket, you may want to try a mexican market if you have one in your area. i have always wanted to do something with tomitillos, but they are a bit intimidating to me for some reason, but a flickr contact gave me this recipe and i needed to try it. this was actually a super easy salsa to make and it is so good! it's a very mild salsa, but it's easy to pump up the spice with a hotter pepper. and i have a passionate love for cilantro, so anything with a mess of cilantro involved and i am totally sold. broiler to high. remove papery husks from tomatillos and rinse well. cut in half and place cut side down on a foil lined baking sheet. cut peppers and place on baking sheet as well. roast in the broiler for about 4-6 minutes untill skins start to blacken. once they are roasted, allow them to cool for a few moments and place all the ingredients in a food processor or blender and pulse until ingredients are chopped and nicely mixed up together. add salt to taste and cool in the fridge before serving. i plan on trying out a few more recipes for salsa verde to see if i can get a high enough acidity for safe canning and storage but still keep the fresh flavor. more on that soon. Sarah!! 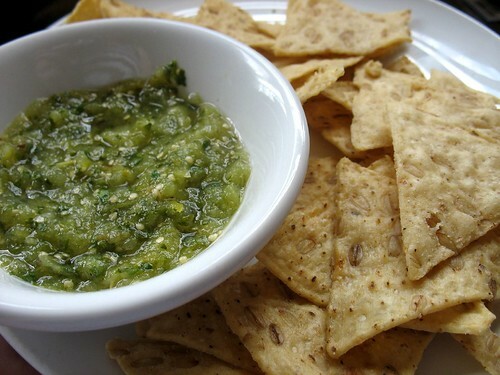 I LOVE salsa verde. It's one of my favorite salsas ever. I don't know why it never dawned on me to try to make it myself. You are such an inspiration.